“The decision to remove the CBI chief has further dented the credibility of the CBI, which has been wrecked by the PM,” Congress spokesperson Anand Sharma said at a press conference. 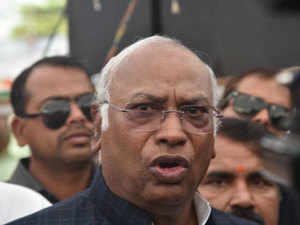 Kharge placed in writing his objections to the manner in which the CBI chief was shunted out and questioned the credibility of the “allegations” made in the CVC report. NEW DELHI: Congress leader Mallikarjun Kharge, one of the three members of the high-powered panel that sacked CBI chief Alok Verma, is said to have stoutly opposed his removal. The committee led by Prime Minister Narendra Modi, which included Justice AK Sikri and Kharge, the leader of the opposition, removed Verma as CBI director a day after he resumed office on charges of corruption and doubtful integrity levelled by the Central Vigilance Commission. Kharge placed in writing his objections to the manner in which the CBI chief was shunted out and questioned the credibility of the “allegations” made in the CVC report. He argued that the anti-corruption watchdog itself was in the dock after the Supreme Court reinstated Verma on Tuesday by rejecting the CVC’s stand. The Congress termed Verma’s removal as a “panic reaction of the PM” who is worried about “skeletons tumbling out”. The Congress will cite Verma’s removal in its crusade against Modi’s Rafale fighter jet deal and in its Lok Sabha election campaign, which is set to roll out across India from February 15, with rallies to be addressed by party president Rahul Gandhi, AICC office-bearers and PCC chiefs decided at a meeting on Thursday. Sources said during the panel meeting, Kharge complained that he was not given enough time to study the CVC report and that Verma, too, was not given a chance to defend himself. Kharge said Verma should have been allowed a full term by adding 76 days that he lost after he was sent on leave.